Alright so now that I’ve had a little bit of time to breathe, and drink some champagne, and sleep, I want to give you all the details on my RD exam experience. I know a lot of RDs-to-be read my blog (even if you don’t comment, I still know you’re out there!) so I want to give my little two-cents if I may. Warning: longest post ever, if you don’t care how I studied, just scroll to where I start talking about my experience with the exam. Anyway, as you may know I finished up my supervised practice in the end of July. I then went to Michigan for two weeks on vacation and put everything completely out of my mind. What happens at the end of your internship is that your program director will compile ALL of your information, paperwork, hours, etc. and signs off on their part, saying that you met all requirements of the program (aka 1200+ hours of supervised practice in total). They then send that information off to the Commission on Dietetic Registration (CDR), who also verifies everything. Once you’re verified, they contact you by e-mail saying that you are eligible to sit for the exam, and soon after you’ll get a second e-mail with directions on how to schedule your exam. This can take anywhere from 1 week to 6 weeks, or so I’ve been told. For me, it took 5 weeks. So that means I got my verification at the beginning of September. Prior to this, in the couple weeks that I was here in August, I did some passive studying. I had purchased the Jean Inman review guide because I couldn’t make it to her lecture up in Northern Florida that month (bad timing, too far of a drive). Instead, I read through the entire Inman binder once, without taking any notes or really committing anything to memory. It’s pretty thick, and very content heavy, so I just wanted to get a grasp on some of the information before I really buckled down. Once I got my verification e-mail, I scheduled my exam for two weeks out and basically kissed the outside world goodbye. I went back through the Inman binder again but this time while listening to her lectures on the CD’s that she provides. It’s a little dry at first, but you get used to her style of speaking and I actually ended up really liking it. She goes along with the binder exactly, but she doesn’t read everything, just points out the important things to know and puts it into perspective. I had a separate, blank notebook that I was writing notes in rather than jumbling the pages of my Inman stuff with a bunch of crap. Anything I didn’t think I would remember or thought was important, I wrote it down. I wrote A LOT. I paused the CD’s probably every 30-60 seconds to just write things down. And yes, it took me a while to get through it this way. I spent about 4 days doing just that, studying for an average of 8 hours per day. I treated this like a full time job! There are 4 seperate domains, and I tried to average one domain per day but the first two are very comprehensive with a lot of science and clinical nutrition stuff. After I finished going through the binder, I went back to sections that I new I would need to make notecards for. Most of my notecards were the vitamins and minerals, foodborne illnesses, all of the community programs and their acronyms, management styles, and foodservice formulas. Other random things I thew in there too, like the different study designs. I ended up also making a chart for the foodborne illnesses because it was easier for me to compare and contrast them that way. But that’s just how my brain works. Once I felt fairly confident in knowing the content, I started to work my way through all of Inman’s practice questions. She splits it up into 3 sections of about 300-400 questions, so I did one section per day. My strategy for this was that I would go through 50 questions at a time, trying not to refer to any materials for help, and then go through those 50 questions with the answer-key. Any question I got wrong I would write down the correct answer, and any explanation to make myself see the reasoning. And yes, I went through all 1000+ questions, I just wanted to make sure I was giving myself enough practice. One thing I will say about practice questions is don’t worry about how many you are getting wrong! Someone once told me that you learn best in situations where you’re learning what you did wrong and why. So after pretty much making that Inman review my boyfriend, I moved onto my second course of studying. 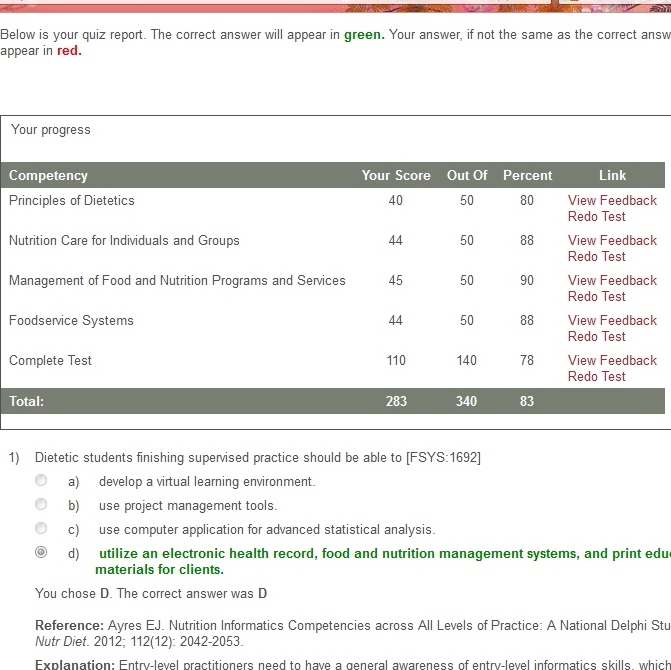 My program director graciously provided us with access to the Academy of Nutrition and Dietetics online student exam prep practice tests. I’m not sure how much this would cost normally, but it is definitely worth checking out. They have tests for each domain consisting of 50 questions that you can take as many times as you want, which is nice because the questions differ each time you go through it. I did each domain test 2-3 times. There is also a larger test that is suppose to simulate the actual RD exam, and is 140 questions. I did that twice also. Two things I liked about this: 1) once you submit your answers, the correct answer is highlighted with an explanation as to why, and links to credible sources if you really don’t get it and 2) the questions were more critical thinking than the Inman questions, which I think reflected the exam better. I started to get really nervous, actually the nerves hit sometime during Saturday afternoon. The day before the exam (Sunday), I read through one specific section in the Inman binder again that had all pertinent clinical nutrition information (all of the disease states), went through notes, flash cards, and looked back on things I thought might be leaking out of my brain because I had it pretty much at capacity. I only studied for a few hours and then put my stuff away at 8pm. Another tip I’ve learned about taking big exams is to NOT cram at the last minute. Take at least 12 hours to do something else, like sleep, relax, listen to music. etc. I laid on the couch, listened to music and drank a glass or two of wine (ok, 2). 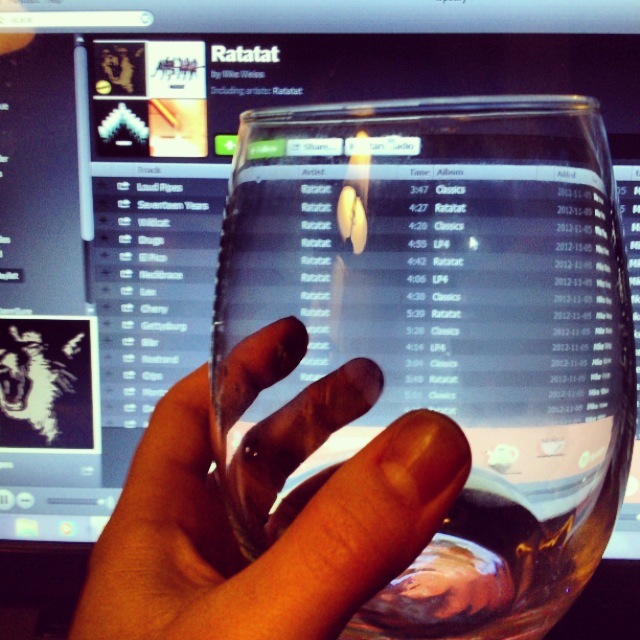 I seriously considered not drinking wine, but then came back to my senses and knew it was the best way for me to relax. 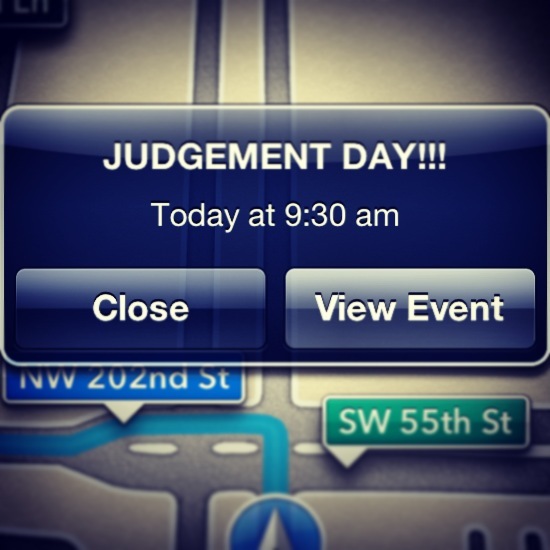 I also made sure I had my confirmation e-mail printed and in my purse for the next morning. I woke up at 6am, drank coffee and ate an egg and cheese sandwich (brain food). My testing site was down in Miami (of course), and a week earlier I had made a dry-run to the address just to make sure I knew how to get there since I have quite a track-record of getting lost in Miami. I left my apartment at 7am since I knew it would take me about an hour to get there, and who knows with Florida drivers which highway is closed due to an accident. I pulled in the parking lot at almost exactly 8am and I didn’t have to be there until 9am. I sat in my car for a while looking at Instagram, trying to keep my thoughts off of it. I actually brought my foodborne illness chart to review and a few foodservice equations to look at, which I’m glad I did because it helped me to just focus on those things and not start getting in my head about “OMFG I’m going to fail”. At about 8:30 I started to sweat and freak myself out, and knew I had to get out of my car. It was on a quiet road so I got out and walked up and down the road a couple times. This probably saved me from having a panic attack, the fresh air was just what I needed. Oh and by the way I am NEVER this nervous or uptight about anything, ever, so this is was all completely unlike me. Once I calmed down, I decided to just go in, check-in, and chat up the person at the registration desk. The guy took my ID and confirmation info, made me sign some paper (probably saying they’re not liable if I have a heart attack) and said “Oh, you’re taking a CDR test? Man, people either hate me or love me when I give them their test scores… Please don’t make me make you cry today, you look like a nice person”. I was like WHAT! DON’T TELL ME THAT! I confidently told him that I was going to pass, there was no other option. In retrospect, I kind of wish I would have told him to shove it. Soon after, the guy set me up at my computer cubby which was equipped with scrap paper, pencils, a basic calculator and earplugs. I kind of laughed when I saw the earplugs but I ended up using them because whoever was sitting next to me was taking a test that required them to type the ENTIRE time and it was driving me insane. After logging in, I was off! I wish I could give a little more insight of the exam itself but honestly I think I blacked out. My questions were pretty evenly dispersed through all of what I studied. What I know about the test is that it pulls from a big bank of questions (I’ve heard thousands) and the test adapts to how you answered the previous questions. Basically, it’s meant to find your weaknesses. There are 125 questions, but it can go up to 145 if you got a certain percent wrong and wants to give you an extra chance to redeem your score. Also, according to the Academy, within the 125 questions are several “test questions” that don’t even count for your score. TALK ABOUT CONFUSING. It’s not worth trying to figure out, just sit down, answer your little heart out, and hope for the best. The exam was brutal. Sorry guys, I know you were all hoping I’d say it was a breeze and I wish I was kidding. My strategy for the test was to go with my gut. If I ever picked an answer and then wavered to another one, I told myself to just go back to my original answer and stick with it. Once you answer a question and submit, you can’t go back. Terrifying. I was convinced I was failing. I’m also usually a very fast test-taker, but you have 2 and 1/2 hours to do the test so I made myself slow down, and read questions a few times through. I took almost exactly 2 hours to finish the test. Right after the 125th question, my test timed out and sent me to a quick survey about the exam. I thought for sure my test would go into the 140s so at that point I knew I had either completely bombed or passed with flying colors. I was panicking. I ran up to the registration desk and was like “I’M DONE, DID I PASS”. As the guy was pulling up my score on the computer he kind of smirked and said “Thank you for not making me make you cry”. I was like “What does that mean?! Did I pass?! What’s my score?!”. He was like “Yes! Well, I don’t understand the scores on this particular test but it says Congratulations so you passed!”. The score is scaled, or weighted or something, to reflect the different domains and the degree of difficulty that your questions were. You need at least a 25 out of 50 to pass. I’m happy to say that I didn’t just barely pass, I actually had a damn good score. First I called Andrew, then my mom, and left my dad a message since he was in a meeting. After that I called my program director, she was so excited for me. It felt SO good to be able to call her and give her good news, she knew I was sitting for the exam that morning. I called and texted so many people. I was just so excited it was over! I’m actually surprised I didn’t cry. This is that one final goal of 6 years in the making, with so many obstacles along the way, and I finally conquered it! I promptly drove myself to Whole Foods to treat myself to hot-bar lunch and a giant black&white cookie from the bakery. Andrew and I also went out to dinner later, but I’ll tell you about that in another post. It involved lots of wine, and a little bit of bubbly. 1) Yes, you need to study, but don’t over study. I talked to a lot of RD’s that had taken the exam in the past few years, and all of them said that 2-4 weeks of studying is plenty. It all depends on what your schedule is like. I think if I hadn’t been able to commit full days to studying, it would have taken me longer than 2 weeks for sure. 2) I studied on my own, but if it’s easier for you to study in groups, going to a review session might be helpful. I need to go at my own pace and work with my own devices so I opted out of that. Do what works for you, not what someone else did. 3) If you’ve made it this far, you already have the knowledge to take the exam, I promise. 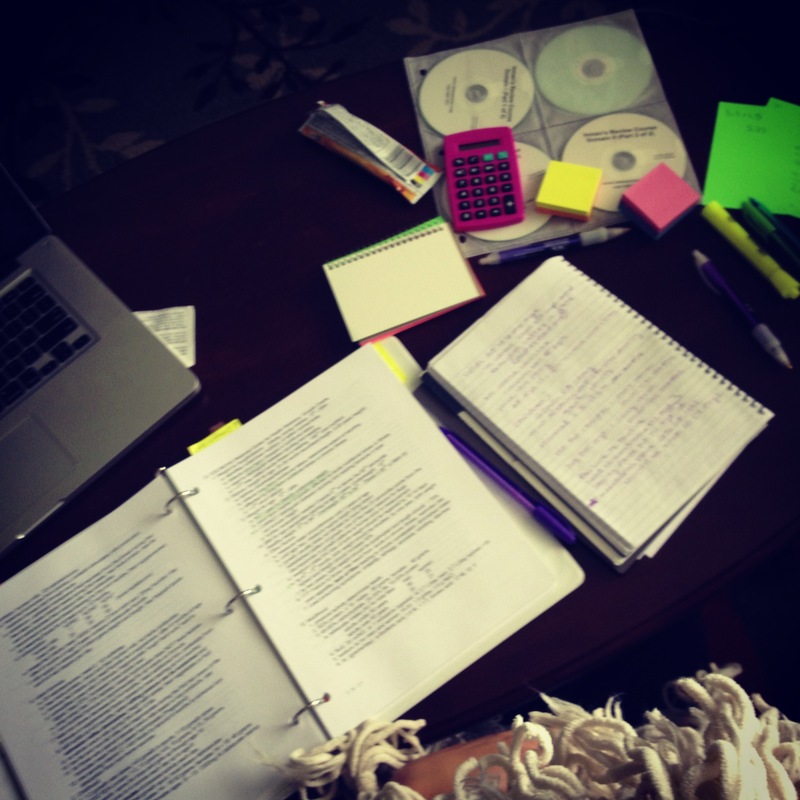 Studying is just a way to ensure that it is all in the front of your brain and ready to go. 4) Remember that the exam is a lot of critical thinking and application, and not so much memorization. Getting the bigger picture is really important.